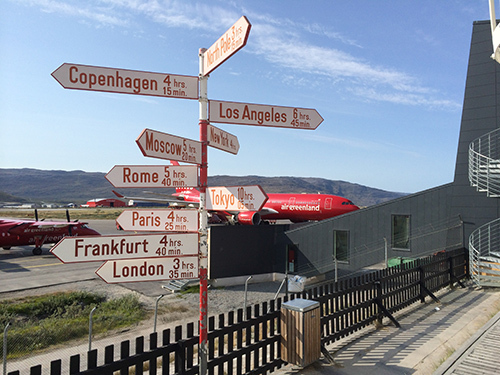 I’m holed up for tonight at the Kangerlussuaq International Science Support center in the settlement of the same name, about 20 kilometers from the edge of the sheet. It’s where we staged many of our activities in last year’s Dark Snow mission, and well equipped for that – although not luxury accommodations by any means. KISS, as its called by the scientists and graduate student who are the primary guests here, is a former Strategic Air Command barracks, and the nearby runway is, for that reason, one of the world’s longest – built to service B-52s. Plenty long – but watch you don’t stray off course. 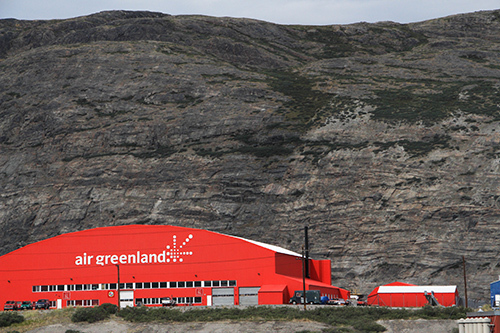 Like Every airstrip I’ve seen in Greenland so far, there seems to be a zoning ordinance that there must be a sheer granite wall within a few meters of the runway. When the daily Airbus 330 “Mothership” from Copenhagen touches down, it’s customary for passengers to applaud. 500 foot rock wall: check. The Arctic summer sun is blinding bright, and its a balmy 59 degrees F here, relatively close to the ocean. 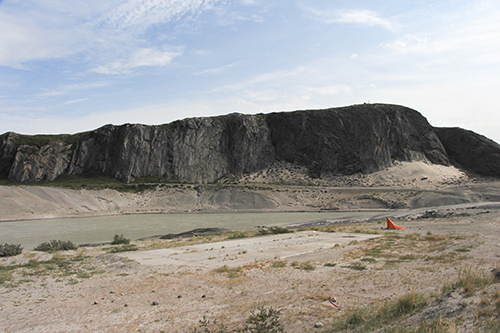 This valley is a bit of a meteorological anomaly and, outside of the Watson River, which flows from the edge of the ice and feeds into the world’s longest Fiord, the immediate vicinity is desert dry, with only scrubby vegetation running up the hillsides. Watson River, looking east toward the ice sheet, about 20 km away. 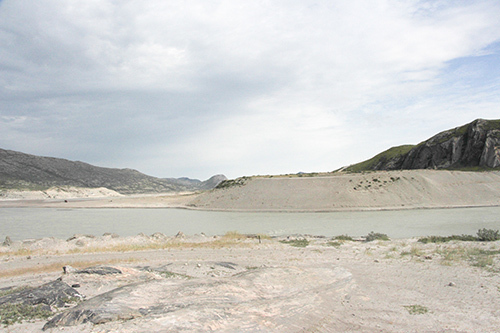 Nearby, outside the rocky valley walls, it’s greener – but no trees. Trees are starting to crop up in southern Greenland, and there are some low bushes here, but nothing like a forest, or even a grove. 40 kilometers up on the ice sheet, where we’ll be hopping tomorrow early, its somewhere around freezing, and we expect, over the coming two week stay, that we will have a mix of sun, snow, and fog. How much of a mix will bear heavily on how much work we get done. We’ll be in the epicenter of the part of the ice where melting has been accelerating most rapidly in recent decades, and the reason we are here is because no one yet knows precisely why. In the spotlight this year is Biologist, Dr. Marek Stibal, who was up here in june to set up several experimental patches on the ice, that will be enriched with nitrates to observe ice sheet organisms response to man-made nutrient inputs. 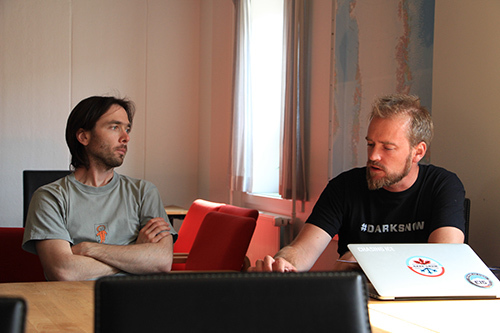 Dr. Marek Stibal, left, in a Kangerlussuaq planning session for tomorrow’s leap to the Dark Snow Camp. At right, Dr. Jason Box. In addition to increased wildfires, the Dark Snow Team will be investigating the impact of algae and microbes, which, increasingly favored by warming temperatures, are gaining a larger foothold on the ice. Dark Snow biologist Dr. Marek Stibal has found that a species of algae living on the ice produces a very special pigment that acts as a sunscreen, protecting it against the intense summer glare. The pigment is the very same molecule that gives black tea its color. The dark pigment, visible in many photos of ice during melt season, is an important, but not well understood, part of the darkening process. As warmer temperatures spread over larger areas of the ice, more liquid water is made available – a vital factor for algae growth. In addition, scientists wonder whether industrial pollution may be delivering key nutrients like nitrogen and phosphorus to the ice, further driving algae growth. Runaway train seems a good metaphor for some people’s actions. See especially the finale. Yes, Runaway Train IS a good metaphor. And the summer is a good time to watch it, because it WILL make you cold. I rented it one January way back then and ended up shivering.